Security Experts at Zsecure.net discover a serious Vulnerability in eToro,which is a financial trading company based in Cyprus and one of the top ranked Forex Trading Service Provider Worldwide. It provides personal online financial services in forex, commodities and stock indices through its own electronic trading platform. eToro is primarily a platform and a software provider; it is not itself a financial broker. Rather, it connects its customers with third party brokerage services provided by various brokers. 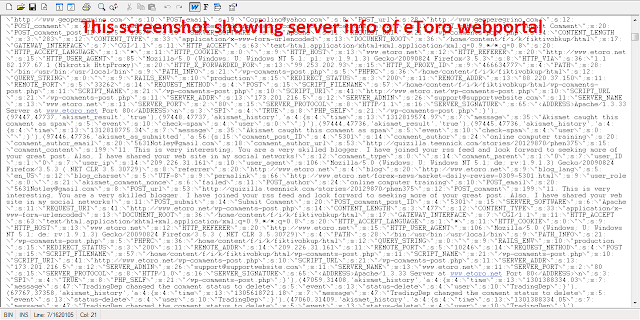 zSecure team has detected detected an active vulnerability in eToro's web-portal which allows the complete access to their database and even the complete database can be dumped/downloaded. Since the company is handling the portfolio thousands of trader's keeping their database vulnerable to outside attack is a shame on the part of the company which is said to carrying millions of value of transactions every month.